AN 80-MILER. We bicycled 80 miles on this day last year to get to a busy little town that put us about 150 kilometers south of Hyderabad--the major Indian city that would be our second-weekend destination. It was one of those days when the town we were looking for was really much further than expected. "Only 20 kilometers to go" really meant 40 k further up the road in the sun, heat, dust, and honking trucks. We were over six hours in the saddle on our 13th day. But we arrived safely. GADGETS FOR THE JOURNEY. 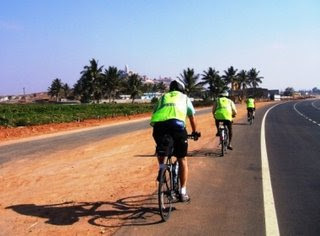 We carried several gadgets on our bikes that heightened interest on the journey through India. Each North American rider had a cycle computer, which measures such things as current speed, average speed, distance for the day, total distance for the trek, rpms/cadence, duration of the ride, maximum speed for the day. I used a handlebar- mounted E-Trex GPS unit, which tabulates information like altitude, direction, and a hundred other interesting geo-positioning facts. Two of us carried binoculars. We took still photos and video footage each day. Bob Yardy make audio reports into a tiny digital voice machine. I listened to music and books on my iPod all along the route. 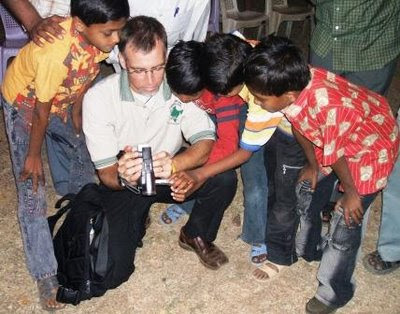 And, of course, we and our Indian hosts all yacked on cell phones throughout the journey (there will be more cell phone customers in India than in the USA by the end of 2008!). INTERNET POSTING. In addition, I would pull out my laptop computer each evening, make an entry, download photos from my camera and Joe's, put the entry and photos on a pin drive and head into the marketplace in search of an Internet cafe. I would post the entries and photos to our blog and check e-mail and news. Almost every town we stayed in had Internet access. Rarely was it high-speed access, but it was usable and useful. NECESSARY OR HELPFUL? All this for a simple bike ride. Were any of these electronic gadgets necessary? No. Were they helpful? Yes. Our Indian hosts and the folks we encountered along the way must have thought we were crazy.